Sri Ramakrishna’s God-intoxicated state alarmed his relatives in Kamarpukur and they got him married to Saradamani, a girl from the neighbouring village of Jayrambati. Unaffected by the marriage, Sri Ramakrishna plunged into even more intense spiritual practices. Impelled by a strong inner urge to experience different aspects of God he followed, with the help of a series of Gurus, the various paths described in the Hindu scriptures, and realized God through each of them. The first teacher to appear at Dakshineswar (in 1861) was a remarkable woman known as Bhairavi Brahmani who was an advanced spiritual adept, well versed in scriptures. With her help Sri Ramakrishna practised various difficult disciplines of the Tantrik path, and attained success in all of them. 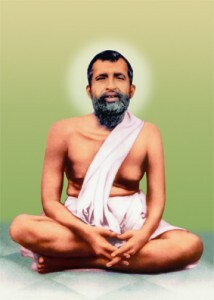 Three years later came a wandering monk by name Totapuri, under whose guidance Sri Ramakrishna attained Nirvikalpa Samadhi, the highest spiritual experience mentioned in the Hindu scriptures. He remained in that state of non-dual existence for six months without the least awareness of even his own body. In this way, Sri Ramakrishna relived the entire range of spiritual experiences of more than three thousand years of Hindu religion. Sri Ramakrishna did not write any book, nor did he deliver public lectures. Instead, he chose to speak in a simple language using parables and metaphors by way of illustration, drawn from the observation of nature and ordinary things of daily use. His conversations were charming and attracted the cultural elite of Bengal. These conversations were noted down by his disciple Mahendranath Gupta who published them in the form of a book, Sri Sri Ramakrishna Kathamrita in Bengali. Its English rendering, The Gospel of Sri Ramakrishna, was released in 1942; it continues to be increasingly popular to this day on account of its universal appeal and relevance.